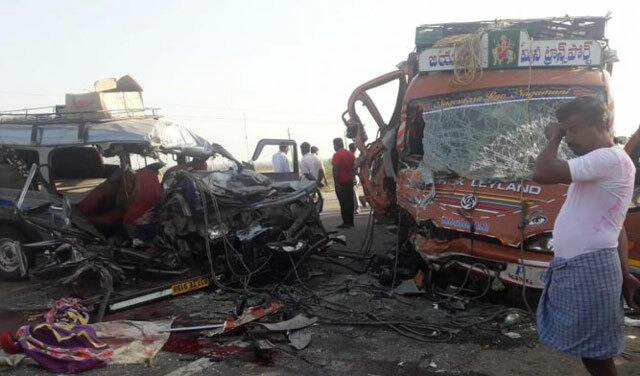 Vijayapura, 23 Mar 2019 [Fik/News Sources]: In a ghastly accident that occurred on the Vijayapura-Kalaburagi nation highway 218, which is infamous as 'Highway of Death', nine people died on the spot and six people, were seriously injured when a SUV and pick-up truck collided head-on, on the early morning of Friday, March 22. This accident occurred on the outskirts of Chikkasindagi at 5.30 am on Friday. The SUV was carrying the tourists who had gone on a tour to Goa and were returning to their native place of Chittapura of Kalaburagi district, while the pick-up truck was plying towards Vijaypura. The impact of the accident was so deadly that eight people died on the spot. The bodies, which were entangled between the iron rods, were removed with great difficulty. One person succumbed to his injuries in the hospital. The dead are identified as the driver of the SUV Srinath Eshwarappa Nalawara (25), Ambareesh Laxmana Dore (30), Yunus Sarvara Patel Kadaboora (25), Sagara Shankrappa Doddamani (22), Chanda Mashaksaba Muzavara (24), Gururaja Sabanna Hakim (35), Shakir Abdul Rahim Sheikh (27), Azeem Abdul Rahim Sheikh (35) and Munsoof Sarvara Patel Kadaboora (28). Manjoora Sarvarasaba Kadaboora (32), Akasha Laxmana Dore (20), Mallikarjuna Basavaraja Jamadara (29), Saddam (25), driver of the pick-up truckSopeti Ananda Nageshwara Rao (25), resident of Tadapalligudam of West Godavari district bordering Andhra Pradesh and cleaner Sajid Ismail Kadarababu (22), who are seriously injured in the collision were treated initially at government taluk hospital at Sindagi and shifted later to Vijayapura district hospital.